The Radlamp 300 is proudly made in the USA. Radlamp is a division of JK microsystems, Inc.
© 2016 RADLAMP All rights reserved. The Radlamp 300 is simple to use and has no operator controls or complex readouts requiring interpretation. The sensitivity of the unit is preset to indicate radiation in the presence of 2 mRem from a Cobalt 60 source, the generally accepted public exclusion radiation threshold. The simplicity and inherent rugged construction of the Radlamp 300 allow it to be field-deployed with minimal training and support. Both the radiation detection threshold and flashlight beam brightness can be factory-configured for specific needs. The radiation threshold can be customized from 1 mRem to over 100 mRem. The battery life can be extended to as much as 300 hours by decreasing the flashlight beam brightness proportionally. Available in black or red anodized aluminum. See the purchase link for purchasing options. 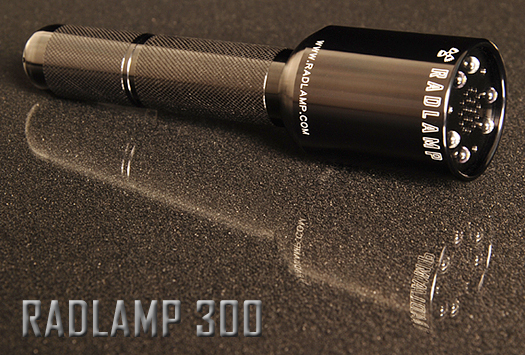 The Radlamp 300 is proudly made in the USA. Radlamp is a division of JK microsystems, Inc.